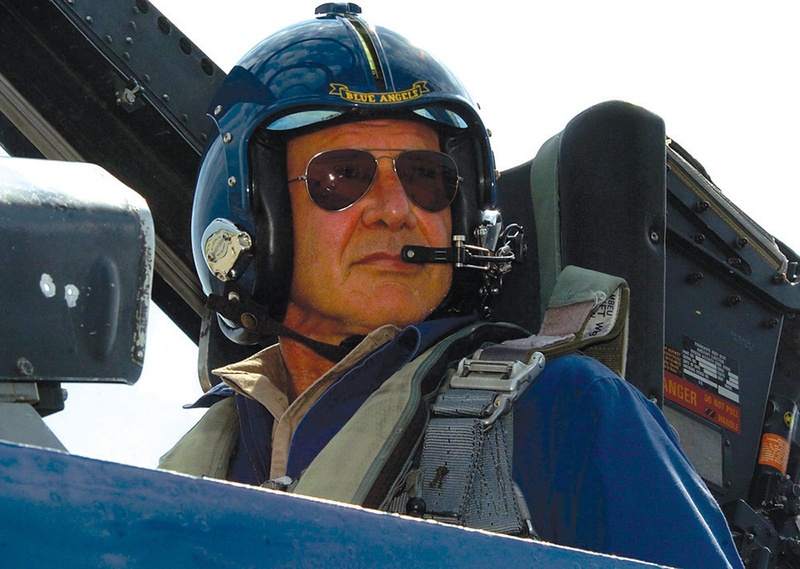 ANGWIN, Calif. --- In what is already being billed as the biggest recruitment coup in Adventist college education, Pacific Union College confirmed today that 72-year-old actor, producer and avid pilot Harrison Ford has joined the school's Aviation program as an instructor. "Not only will I have the facilities at PUC at my disposal but I'll walk students through how I used an inflatable life raft to escape from a plane that was about to crash into mountains in 'Indiana Jones and the Temple of Doom,'" said Ford. "Also no one should forget that I successfully crash-landed a plane in 'Six Days, Seven Nights.' Students can learn from that too." "We are looking forward to welcoming Mr. Ford and giving him a tour of our campus-based airport in the near future," said Aviation Department Head, Jan Forsberg. He emphasized that Ford would bring with him "an incredible breadth of experience" to the PUC Aviation faculty and would lend greater credibility to the school's Aviation degree programs. "Anyone who has followed Mr. Ford's career knows that he is a legend both on and off the screen," said Forsberg. He stressed that the actor's survival of a real crash landing shows that his talents have a genuine, real-world application. "We need him. This guy is indestructible." Slide Show: Are you Adventist-Hot? Ford’s favorite hymn is ” I’ll Fly Away, Oh Lord, I’ll Fly Away”. Once in awhile Ford sings, “Beyond the Sunset” & “Far Beyond the Sun”. Maybe it’s “Count Your Blessings”? Reminds me of the Wright plane, “Vin Fiz” trying to go coast to coast in 1911. Pilot Rogers crashed in Middletown, NY. Took 49 days to reach the West Coast!! Fly on, Ford. Woe is me! UPDATE – BREAKING NEWS: Rumors are swarming around the campus of Southwestern in Keene, Texas. The university, not to be outdone by PUC and Oakwood, has just inked a deal with noted personality Dwayne Michael Carter, Jr., better known as Lil Wayne, to head up a new hip hop major. Dr. Melody Staff, chair of SWAU’s highly-reputed music department, said this is just what the university needs to put it on the map. Meanwhile, an exuberant Lil Wayne beamed from ear to ear as he explained how happy he is to come out of the retirement that he took at age 35 in 2011, and stated that the new venture is consistent with the mission of his One Family Foundation. He also assured the crowd that any rumors about substance use are false. Although he is not yet a member of the church, he assured SWAU administration that he is open to thinking about it and he does read the Bible. Anonymous sources in the administrative offices divulged that they’re not too concerned about his religious affiliation as long as his academic affiliation generates lots of money for the university. Awesome! Now I’m gonna transfer to Southwestern. Lil Wayne will be a sick professor! He definitely has real-world experience. I would go to PUC, but I’m not into flying; it’s of the devil because only birds and bats were intended to fly. Another rumor circulating around PUC is that President Barack Obama is in negotiations with the PUC board of trustees to take over as president and CEO of the university in 2017. The board is still debating whether to invite Vice President Joe Biden to become senior vice president. “His reputation for gaffes and Bidenisms is somewhat worrisome,” remarked board chair Dr. Faith Moore, who was concerned that Biden’s loose talk might affect financial donors. The chair also explained that Obama and Biden will be exempt from the policy requiring administrators of SDA colleges to be members of the church. As long as Obama and Biden are willing to publicly promote church values verbally, they will only be required to “talk the talk” and not “walk the walk.” “It’s a win-win solution,” chimed Dr. Moore. Expect PUC’s insurance costs on their aircrafts to hit the roof. Even though as POTUS, Mr. Ford survived “Air Force One,” the 747 did not. Jim, I’m assuming this article is a spoof? How awesome to have one of my favorite stars at PUC campus! I wish I was there when he comes to take pictures. This will be great for the students. Who knows if this is an opportunity to witness to this celebrity.Enjoy his training! People are actually buying this?….lol. Please be advised that PUC will no longer be covered under our policy. Good luck. Whether this is true or not, adventist schools seem to be enamored with celebrities in their schools. If this is what you are trying to. Get this head line. Hugh Hefner to become publishing manager for Pacific Press Publishing Association where the Word is Life. … As Seventh-day Adventist Christians, we graciously welcome Hugh Hefner and are looking for changes to increase circulation off many of the monthly magazines. Would he uphold biblical principles of modesty? Centerfolds with ankle-length dresses and head-coverings? God forbid we allow a non SDA to be drawn near to us, maybe the Baptist should be the one’s reaching out to people for God. I’m sure it must be worthless to have a teacher that has actually survived in flight emergencies, when we already had some that could teach the theory. Whats next ?? Will he be able to attend the campus church ? Are they even going to let him support mission work. Greg, don’t worry. Pastor Mark Witas of the PUC College Church has confirmed that Mr. Ford will be allowed to attend the church as long as he brings a visitor’s pass and performs a ritual cleansing bath before each service. Mr. Ford’s money will also be accepted to support missions as long as a team of conference treasury officials performs a prayer ceremony to sanctify each cent. It would be a lot easier if Mr. Ford would just get baptized! I think some people don’t understand what satire means. I got taken in by this lie, and others were lied to through me before I discovered the deception. You may consider this to be merely humor, or satire. If it were marked as such up front when it showed up on my Facebook page, I would accept it as such, and be happy to laugh along. That was not the case, however. It is true that “A merry heart doeth good like a medicine…” But this piece crossed a line it should not have. Take better care in what you print in the future. Not all jokes are equal. i am an alumnus of Pacific Union College, having taken both my undergraduate and a year of post graduate studies there. Please make sure you represent our school favorably. It matters that you do so. Basically, this whole thing is a waste of time! We are to answer for the use of our time. …just sayin’. I believe that barely adventist is just that, barely adventist, in name only. You tell things like it is the truth and it is not, I think God calls that a lie! I like humor that is honest!